Infinity-corrected optics are now standard in research microscopes throughout the industry. 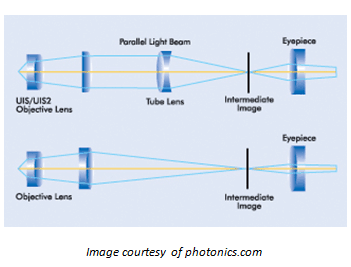 In an infinity-corrected optical system, the light beam transmitted from a specimen being observed, passes through the objective lens and does not form an image; instead it continues as an infinity parallel beam in the tube lens which then forms an intermediate image. In a finite-corrected optical system, the objective lens forms an intermediate image by itself. The advantage of an infinity-corrected optical system is that a parallel light beam passes between the objective lens and the tube lens. In this case, even when a parallel flat plate is inserted between the objective lens and the tube lens, the parfocal point is unchanged, and no image shifting occurs in the process. This technology allows you the flexibility of taking an intermediate lens in and out of the parallel beam section between the objective and tube lens.